When I travel, I tend to keep a diary. Occasionally, I try to draw cartoons based on an entry – it’s good practice and provides some inspiration. This is a reflection on my recent flight from Calgary to London. I failed to draw the man reading a ‘Guns and Ammo’ magazine who was on the verge of using the baby as target practice. I did feel sorry for the baby as it obviously wasn’t well. Its parents tried incredibly hard to pacify it, but the combined experience of being shoehorned into a seat, subjected to the tinny sound of ineffectual headphones from the man sitting next to me AND a crying baby, made for a horrific journey. 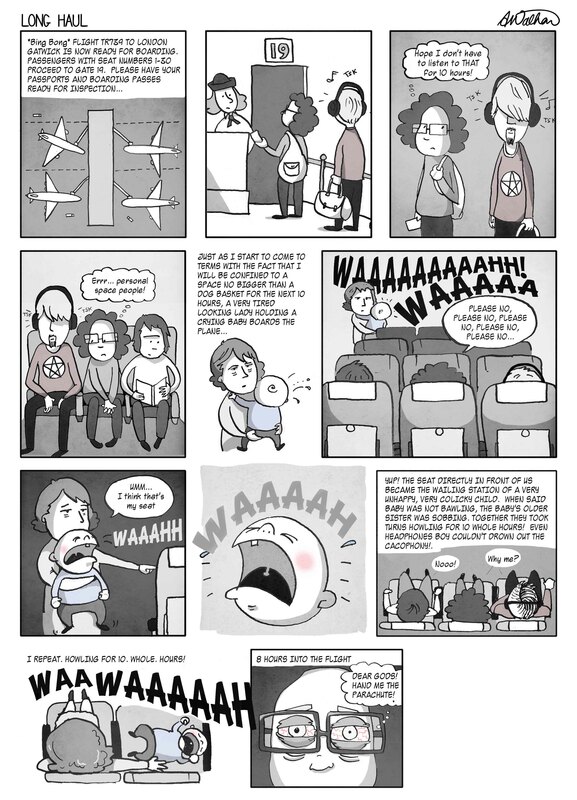 This entry was posted in Life, travel and tagged babies, cartoon, children, comic, funny, planes, travel by bighair63. Bookmark the permalink.